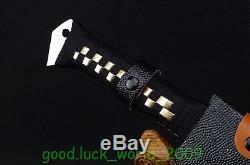 "High Quality Chinese Short Sword Dagger Outdoor Camping Knife Sword Sharp Blade". 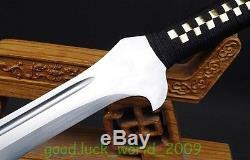 My dear friends, think of our swords are all 100% pure handmade, so the order need to 10 days or so, I hope you can understand. Friendly reminder: Following is a sample hand-measured dimensions (approximately), the Measurements There may be some errors. Moreover, color may not appear exactly as in real life due to variation between computer monitor resolution and lights. 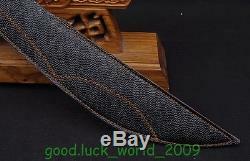 Length: 24.4inch / 62 cm. 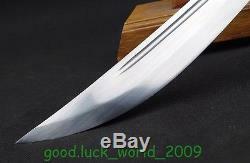 Blade length: 16.92inch / 43 cm. Handle Length: 6.69inch / 17. 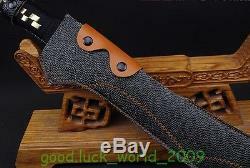 Blade width: 1.81inch / 4.6 cm. 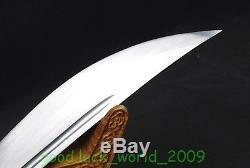 Blade thickness: 0.22inch / 0.58 cm. 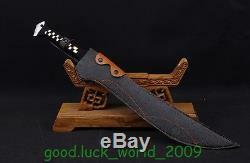 Blade material: High Carbon Steel. Product process: Using the traditional craft refined grain steel blacksmithing, ten manual grinding. The Product is colour may differs, depends on your monitor Color brightness contrast settings. This is just a sword, there is no sword stand, the sword stand is just for the sake of shooting. All pictures were taken in natural light. Our sword of hardness and toughness test. Thank you for your understanding. All the items in this shop are in China. Please pay attention to the fact that it would take longer for international shippings to arrive at your hand than domestic shippings. 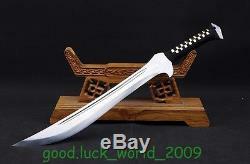 Swords in longquan, is China's famous producer. 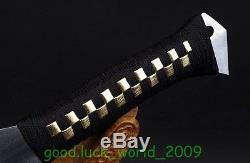 Has a reputation for producing longquan sword is famous at home and abroad. Have you noticed my iron smelting fly flame smoke, red ZiQi burden impressively. 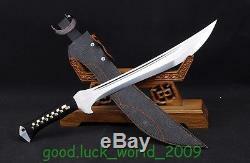 Good workmen exercise every few years, wrought longquan sword name. Longquan color such as frost and snow, the good workmen client lamentation absolute. Coloured glaze jade cartridge spit lotus, wrong filled afterward. Not gold hit the moon... This is the tang dynasty poet Guo Zhen poetry. 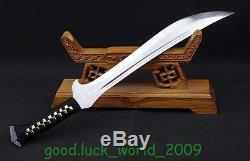 Longquan sword is the crystallization of the wisdom and sweat of industrious longquan people. Longquan finally to longquan sword 2600 rhyme at the end of traditional sword culture, inheritance develop casting longquan sword ancestral craft, set the essence of the peers, the nature of the heaven and earth, the world of the selected material, forging, shovel, file, carved, quenching, grinding and so on more than 20 process of casting and become, with its "tenacity, soft and sharp, cold light, aggressive, and decorative qiao zhi" characteristics is famous in the world. Our factory has many skilled cast jian, grinding, carving technicians, technical information and power is strong, has been committed to the research and development of the traditional longquan sword, a sword, and constantly improve the technology, cast jian as far as possible using traditional craft to forging sword sword, constantly, have made new achievements and development. Factory employees work together to continuously forge ahead, and constantly expand business visibility, expanding the market at home and abroad, and let the market constantly to understand and accept us, make customers more trust us, choose us for ever. Our products sell well in domestic market and exported to Europe, America, southeast Asia, the Middle East, Australia and other countries and regions. We in line with "sincerity, quality to him, " the principle of service to you. We will never live up to every sword lovers as well as the general new old customers friends to our hopes and support over the years, make persistent efforts, strive for perfection, every knife, sword is a boutique. We are not responsible for any injury caused by the use of our sword. Add a map to your own listings. The item "High Quality Chinese Short Sword Dagger Outdoor Camping Knife Sword Sharp Blade" is in sale since Thursday, February 23, 2017. 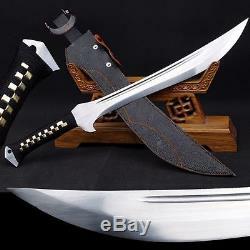 This item is in the category "Collectibles\Knives, Swords & Blades\Swords & Sabers\Asian\Chinese".luck_world_2009" and is located in Longquan. This item can be shipped worldwide.